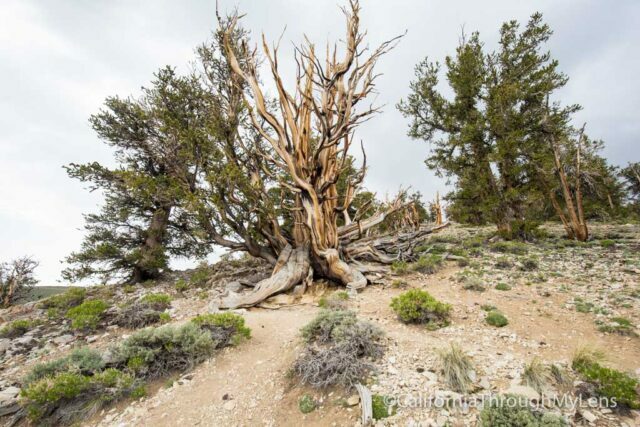 Located high in the hills above Big Pine / Bishop, the Ancient Bristlecone Forest is one of the most unique spots you can visit along Highway 395. 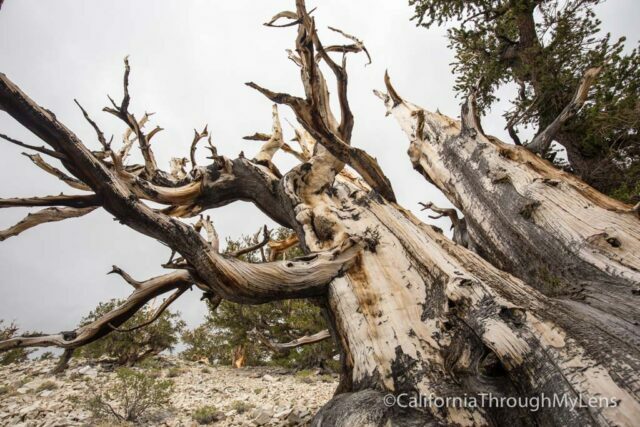 Many of these trees have been here for over 3,000 years and the stark landscape they survive in is something you have to see for yourself. I got a chance to explore the Patriarch Grove a little while ago and decided to do the Discovery Trail at the visitors center on the way out. 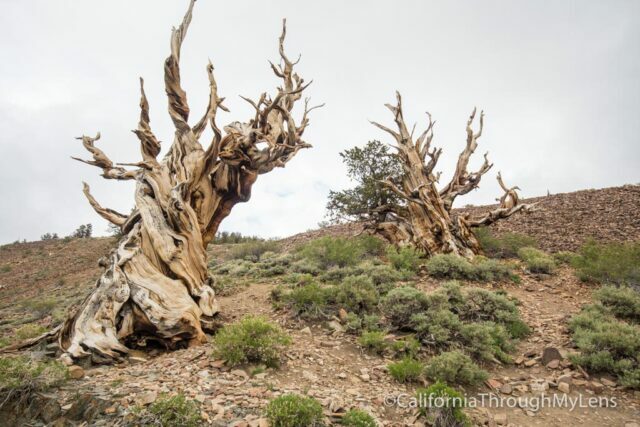 While it is only about a mile round trip, it is still an amazing way to get to know these trees, here is all the information. 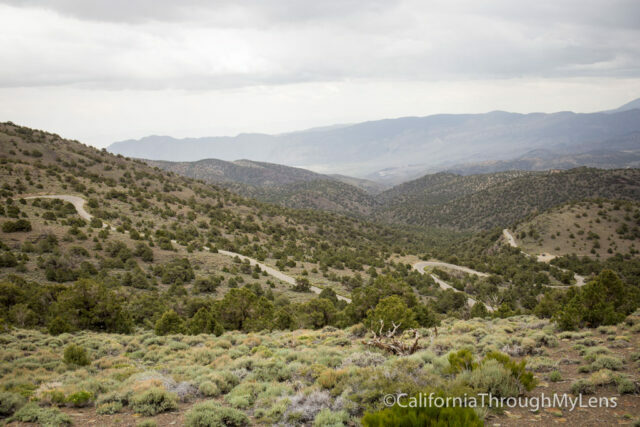 From Big Pine, you will head East on the last road in the town, which has a sign that directs you to the forest. 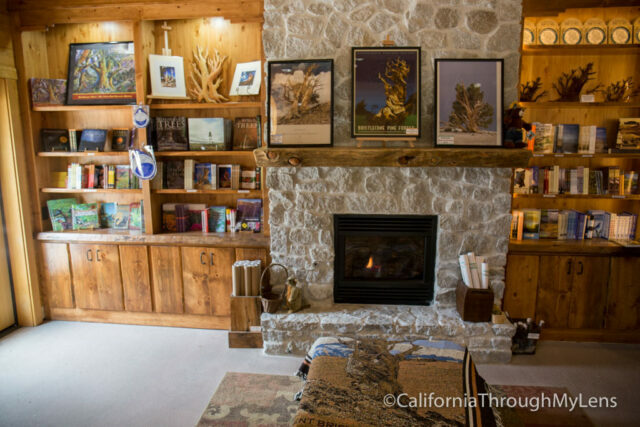 After about 30-45 minutes driving on a windy road (follow signs) you will reach the visitors center. There is a large parking lot. The Visitor Center itself was built in 2012 and is a beautiful building nestled in the heart of the forest. Inside you can talk with the rangers about the area (open in summers only). They have a few exhibits about the grove and the trees while also selling different magnets and stuff you would expect to see in a park gift shop. 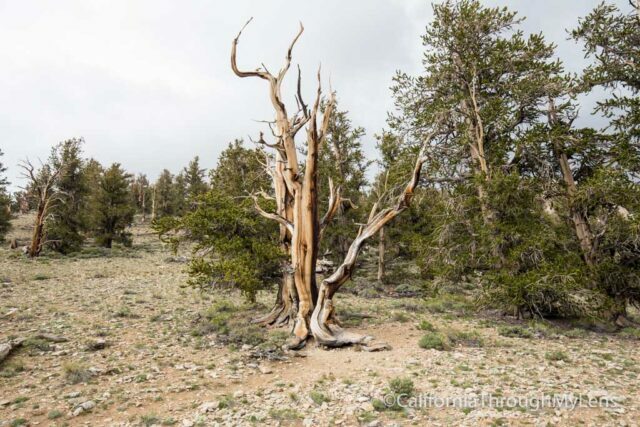 The oldest tree is somewhere in the Methuselah Grove but they don’t tell anyone where because of vandalism, and I am glad they keep it a secret. 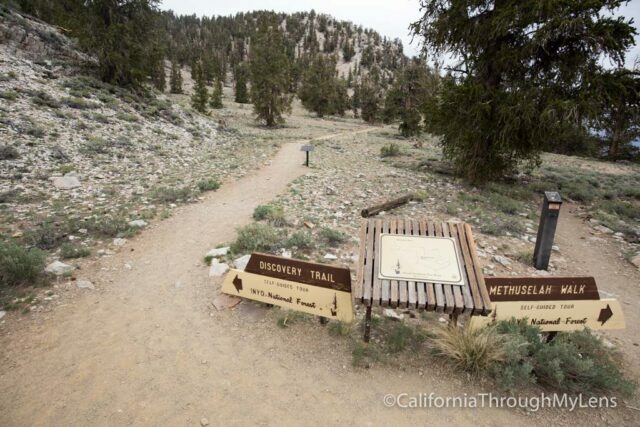 Since I had been in the Patriarch Grove for most of the day though, I did not have time to do the 5-mile Methuselah trail and just stuck with the Discovery Trail. 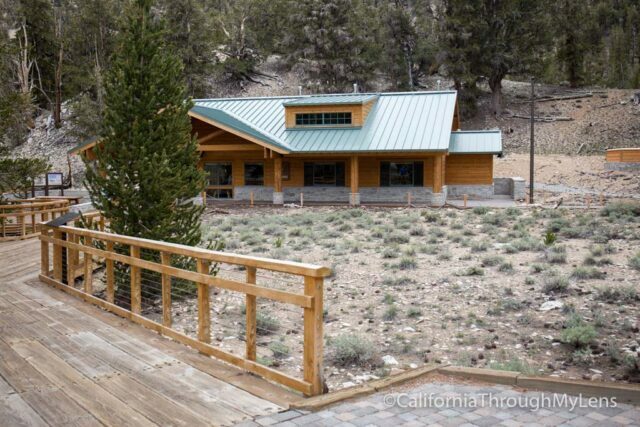 The hike starts from the visitors center, and it immediately heads on a leisurely uphill walk. 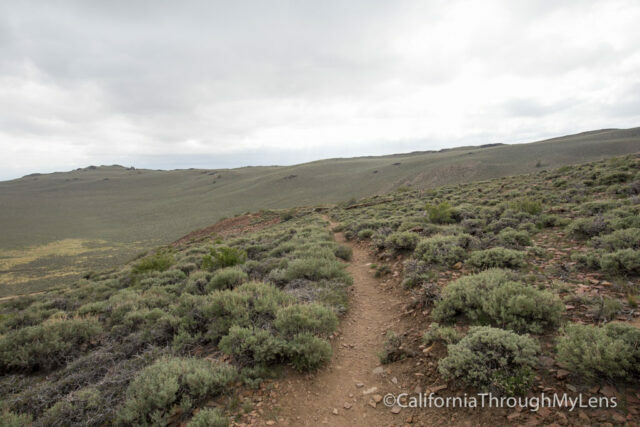 The uphill portion seems more intense due to the fact that you are already at 10,000 feet, and the elevation slows you down. 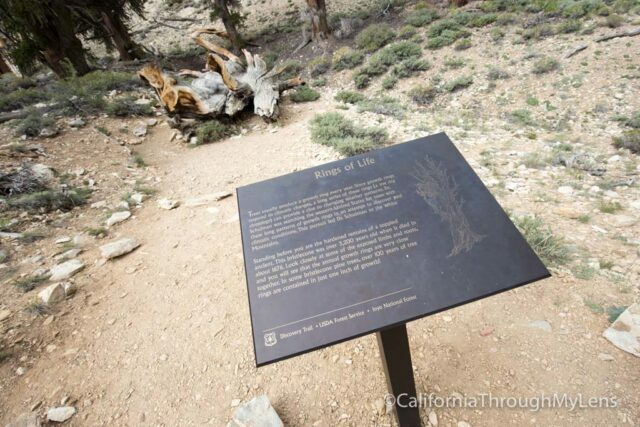 The trail has lots of informative plaques along the path, and I enjoyed reading them as they talked about the trees themselves and the man who found and helped to protect the grove. It was an interesting story to read. 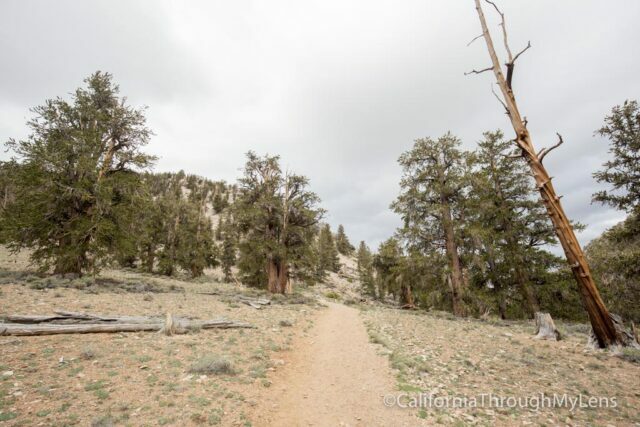 The beginning of the trail takes you through some trees but nothing too spectacular, but once you get about a quarter of a mile in on the switchbacks, you start to see the gnarled bristlecones appear. 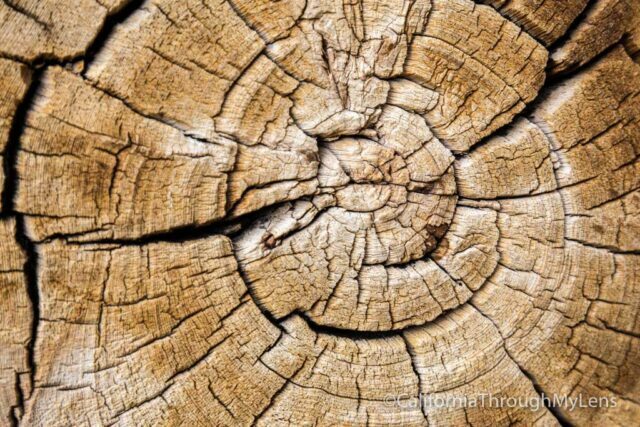 They continue to get better as you head up though so keep in mind that better trees are yet to come. 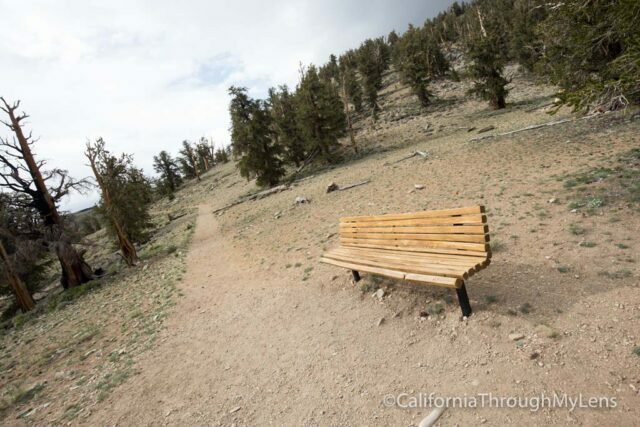 The switchbacks themselves have a few spots with benches so that you can take a break if you need it. 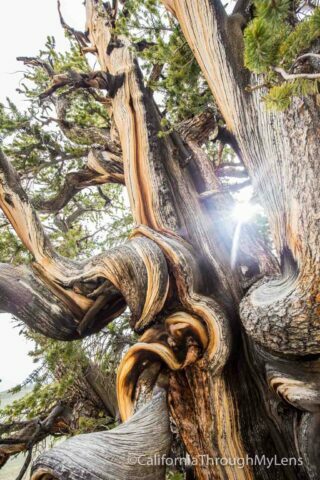 When you reach the end of the last switchback, you will see one of my favorite trees on the trail. This tree had a unique collection of swirling branches coming off of it and it was fantastic for photos. From here you will head into the grove, and there are a half-dozen or so trees to look at, some of which are thousands of years old. My favorite was the one right in the middle that had a small arch underneath it from the exposed roots. 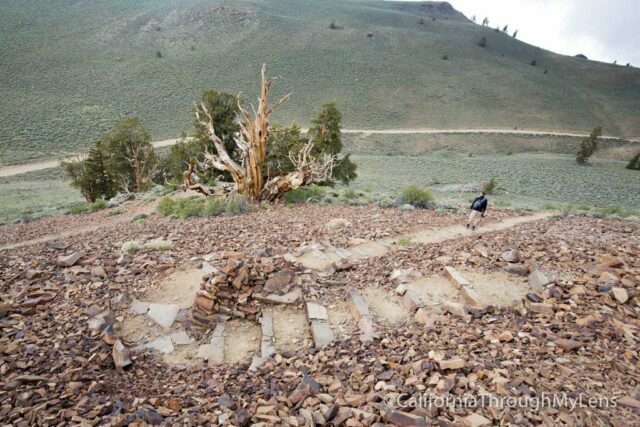 After exiting the grove, the trail starts to head down and will take you through a large section of slate-type rocks. 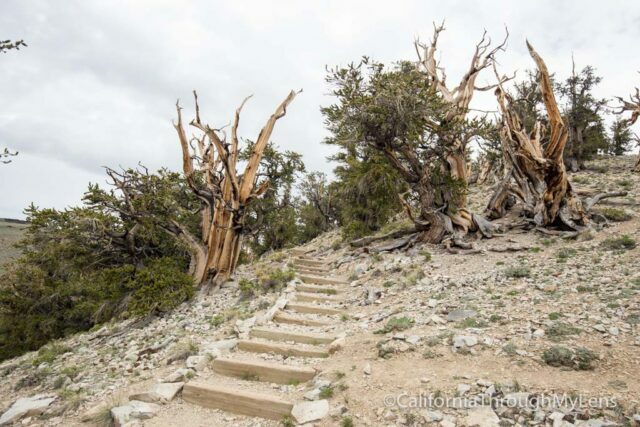 From here you will reach the two best trees on the trail and some of the most photographed in the park. The sheer size and beauty of these bristlecones make them a spot where you will want to just sit and take your time enjoying them. I like the lower one best myself as it has all of the styles you have come to expect from the trees, in addition to being on an uphill so you can photograph it from below. This is the tree you often see in the night shots taken from the grove. After this, the trail just winds back down the hill to the parking lot. 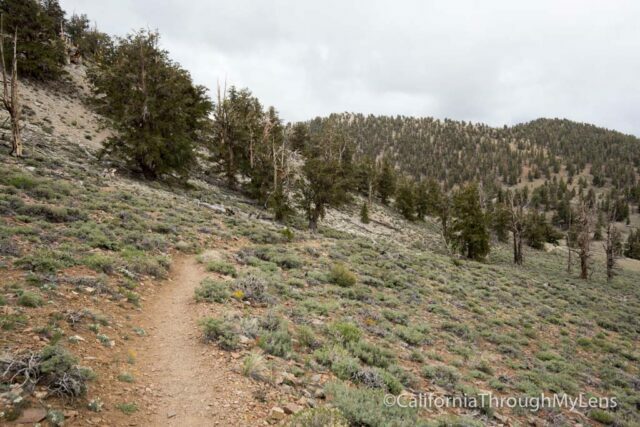 All in all, this is a fantastic one-mile trail that you will enjoy. I highly recommend that you check it out if you are in the area and make sure to bring your camera as the trees here are incredibly beautiful. Let me know if you have been in the comments.